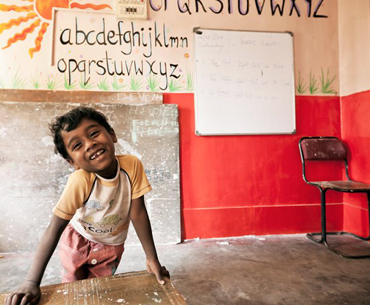 Six years ago, 5 college students walked into a shelter home in Kerala, India and left with an idea to make a difference in the lives of the young children they met that day. According to Make a Difference (MAD) founder, Jithin Nedumala, what they saw were disadvantaged children caught in a disparity between the rich and poor, widened by an uneven education system. Today, 1,200 MAD volunteers teach over 4,000 children in 23 cities across India. The organization partnered with Cambridge University Press to teach English language skills that are critical for success and confidence. But MAD is a lot more than a teaching organization. MAD also started its innovative placement project in which field trips are planned to expose young children to their dream jobs. MAD Founders felt that education should be about more than reading books and learning English; it’s also about experience. Part of what makes MAD so successful is that its staff invest in volunteers. In addition to their good intentions, MAD volunteers undergo teacher and curriculum training to prepare them to be the most effective teachers they can be. What’s even more amazing is that the average MAD teacher is between 19-20 years old, in college, and teaches every weekend. After a year, volunteers are eligible to apply for MAD’s leadership development program and lead their own chapter. For kids like Jobish Matthew, MAD has lived up to its name. Jobish was accepted into the US State Department’s prestigious ‘Community College Initiative Program and boarded the first flight of his life on June 16, 2012. The program enables children who are selected to get scholarships and attend college in the US for one year in any discipline of their choice. MAD had helped him prepare for the competitive English language exam and interview required to participate in the program. His success was not only an inspiration to other kids, but also to the MAD founders, as Jobish was part of the first class of children to begin participating in MAD programs. Photo provided by Make a Difference.